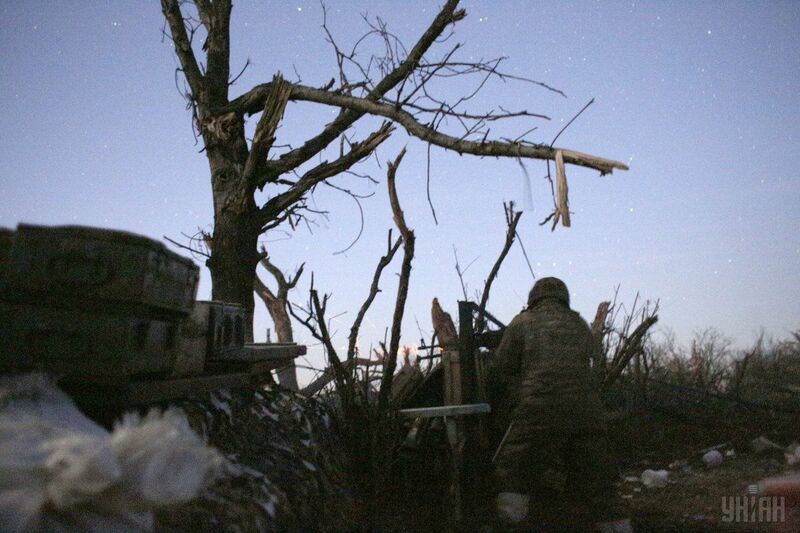 Russia-controlled militants of illegal armed formations in Donbas violated the ceasefire 24 times from 00:00 to 18:00 local time on Sunday, January 22, resulting in four Ukrainian soldiers wounded in action, according to the press service of the Anti-Terrorist Operation (ATO) Headquarters. "The occupiers used grenade launchers, large-caliber machine guns and small arms to fire on the villages of Lebedynske, Chermalyk, Shyrokyne, Vodiane, and the town of Maryinka in the Mariupol sector. Further, Maryinka, and the village of Novotroyitske and the town of Krasnohorivka were under sniper fire," the ATO HQ wrote on Facebook on Sunday evening. The villages of Novo-Oleksandrivka and Novozvanivka in the Luhansk sector came under fire from grenade launchers and small arms. "In the Donetsk sector, the Russian occupation forces used 120mm mortars today to shell the village of Pisky [close to the ruined Donetsk airport]. A sniper was also active there. Grenade launchers and small arms were used to attack the villages of Novhorodske and Zaitseve, and the town of Avdiyivka," the update said. "In total, there were 24 attacks. Four servicemen were wounded in action," the ATO HQ added. Read alsoUkraine reports attacks in all sectors in Donbas in past dayAs UNIAN reported earlier, shelling of Ukrainian positions in Donbas was reported in all sectors on Saturday, January 21, with the total number of attacks on Ukrainian troops reaching 33 instances. The Mariupol sector alone saw 15 attacks. In particular, three skirmishes between Ukrainian troops and Russian-backed militants were reported in Avdiyivka's industrial zone on Saturday. Each of them lasted at least an hour.